It's not just about the casino, say members of the Mashpee Wampanoag tribe who work at Plimoth Plantation. Federal recognition of their tribe, bestowed this year after a three-decade effort, brings financial benefits available only to tribes recognized as sovereign nations, and builds a legal floor under Native claims dating back to the 17th century. Tribal members who work in the plantation's Wampanoag Indian Program acknowledge that the material benefits of their newly won gaming rights have the potential for harm as well as good. They also point out that intangible benefits -- such as the satisfaction that their position has been confirmed by an entity that once banned their language and customs -- vary widely among tribal members. Victory may be sweetest to those who fought for it longest, members said. "It is centrally important to a lot of people, whether or not it's centrally important to everyone," said Hartman Deetz, a tribal member who lives in Plymouth and casts a cold eye on the tribe's relationship with the federal government. Deetz works in the Indian program at the museum, where staff demonstrate and explain traditional native life at Hobbamock's Homesite -- building canoes, making clothes, planting corn, and answering tourists' questions. 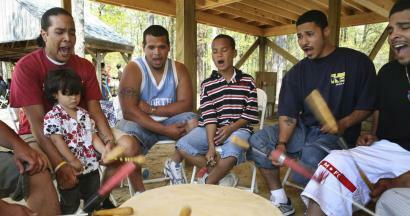 Deetz and others are quick to point out that the Mashpee Wampanoag, who trace their ancestry to the native people who helped English Colonists survive their first vulnerable years in Plymouth, began their quest for tribal recognition in the 1970s, long before the Indian Gaming Regulatory Act of 1988. "My father," Paula Peters said of the late Russell Peters, then the president of the Mashpee Tribal Council, "penned a letter to the US government, petitioning for tribal recognition. But he died waiting for an answer to that letter." The answer came last year, when the government granted final recognition to the 1,500-member Mashpee Wampanoag, only the second tribe in the state to receive it. Recognition of the tribe's sovereign status by the federal government frees the tribe from state and local governance and entitles tribal members to significant financial benefits from education, housing, and health programs. The best-known benefits are spelled out in the controversial gaming act, including the right to operate a casino in a state where gambling is permitted. While tribal leaders and their private backers pursue that opportunity -- recently winning agreement from the town of Middleborough to build a casino resort there -- individual members say "recognition" can be a misleading term. After all, Deetz quipped, failing to acknowledge the tribe's claim to its historic identity would be like "telling the Kennedys they weren't Irish." Peters said that her people didn't need the federal government to tell them who they were, but that they needed ammunition to defend their rights to their tribal home in Mashpee. Assistant marketing director at Plimoth Plantation, Peters helped publicize the Indian program's Strawberry Thanksgiving festival, which drew record attendance this summer. Although her father grew up in Mashpee when it was dominated by a Native American population that had lived there for centuries, things changed rapidly in the '60s, as developers began buying land in the picturesque seashore towns of Cape Cod. Rising housing costs made it harder for Mashpee's Native Americans to stay there. Tribal elders, who had taught children how to clam in local shellfish beds, found some of the best spots closed because of pollution. "We were being pushed out," said Peters. "History was repeating itself. That's what people don't understand." The Wampanoag had been pushed out of homelands that stretched throughout southern New England originally in the 17th century. Despite their storied alliance with the 1620 Pilgrims, by the end of that century almost all of the land that had once been theirs belonged to the Colonists. Mashpee was then guaranteed to the Wampanoag as a tribal home by treaties signed in the 17th and 18th centuries. As large-scale development arrived in Mashpee, however, tribal leaders concluded, "We needed to regroup and assert our legal rights to our ancestral homeland," Peters said. The tribe went to court, claiming to own lands that were increasingly in the possession of non-natives, but their suit was dismissed by a federal judge in 1978 on the grounds that the Mashpee Wampanoag were not a federally recognized tribe. That decision put an exclamation point on the quest for federal tribal status. In addition to strengthening the tribe's legal status, federal recognition opens the way to benefits that can help pay for college educations, housing, and healthcare for tribal members. The Wampanoag Indian Program's assistant program manager, Jonathan Perry, cites the example of his own tribe -- the Aquinnah Wampanoag, the state's only other federally recognized tribe -- which drew on federal programs to benefit its Martha's Vineyard community. Federal funds paid for an ambulance that serves Native American and other residents there. But it's the prospect of casino wealth that draws the the greatest attention -- and presents bigger risks to the tribe, including the risk of change itself. "Money changes people very quickly," said Komi Wildhorse of Middleborough, who also works in the Wampanoag Indian Program. Wealth may bring opportunities, but it also contains "dangerous potentials to have us conform to the ways around us," she said. And rapid changes in economic conditions are most likely to affect the young. "These children are our next generation," Wildhorse said, though the tribe's "young elders" -- such as Peters and herself -- "will try to keep harm away." She cites gains the tribe has made in recent years in restoring the tribe's cultural heritage, such as holding classes taught in the Wampanoag language. Peters said working for Plimoth Plantation's Wampanoag Indian Program as it grew from an afterthought to a full partner in a bicultural institution has given Native American employees a kind of psychic armor that made federal recognition less crucial. "This is a place where we never really felt we had to be recognized by everyone else. We had the intrinsic recognition that goes along with just being here," said Peters. "It's a place where we have so much invested, culturally." Federal recognition may mean more to the generation that began the fight than it does to some of its younger members, Deetz said. Whatever benefits accompany it, recognition "can never make up" for the wrongs done to Native Americans since the arrival of the Europeans, he said. Deetz, 31, who says he cannot afford to live in Mashpee now, believes the tribe's success in the future depends on "how we play the cards we've been dealt." For generations, the tribe's hold on isolated Mashpee was largely a matter of "poverty" and "racism," Deetz contended, because non-natives didn't want to live there. Now, given the tribe's new status, the game has been changed again, though the outcome remains to be seen. "Federal recognition doesn't provide failures and successes by itself," he said. "It provides us with another set of tools." Deetz hopes those tools help build a stronger community in the tribe's ancestral home of Mashpee, where, he said, "I can walk through the graveyard and find generations and generations of my family. No other place on earth has that to offer me." Robert Knox can be contacted at rc.knox@gmail.com.